Trade Select™ Wall Wrap Medium Duty is a Medium Duty wall wrap designed for use in all wall system types, and is also suitable for use under metal roofs. The reflective foil side provides extra R-value when installed facing an air cavity, and the multi-layer structure provides superior strength, exibility and durability. Classified as High Water Barrier, Medium Vapour Barrier, Trade Select™ Wall Wrap Medium Duty acts as a barrier to radiant heat, moisture ingress, draughts and dust penetration. Residential & Commercial Wall Wrap. 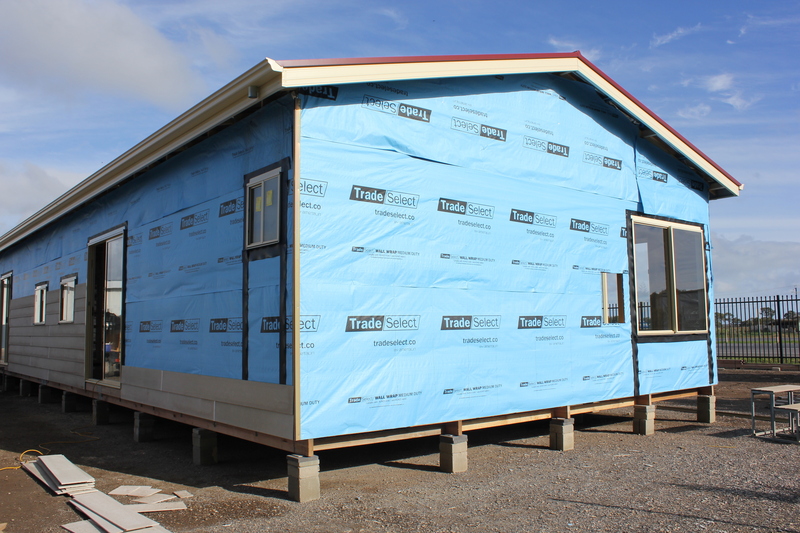 Trade Select™ Wall Wrap Medium Duty complies with AS/NZS 4859.1:2002/Amdt 1:2006 and AS/NZS 4200.1:1994, and therefore meets all the requirements of the National Construction Code and Building Code of Australia for insulation and pliable building membranes. Trade Select™ Wall Wrap Medium Duty complies with AS 3959-2009 Construction of buildings in bushfire-prone areas for use in roof systems BAL – LOW to BAL – 40 and wall systems BAL – LOW to BAL – FZ. Ametalin has assessed Trade Select™ Wall Wrap Medium Duty according to the criteria outlined in the National Occupational Health and Safety Commission (NOHSC):1008 (1998) and NOHSC: 1005 (1999). As a result of the assessment, this product is classified as non-hazardous according to the NOHSC criteria. To reduce risk of UV damage when installing this product, wear protective clothing, safety glasses and sunscreen, and work in the shade wherever practical. The insulation to be installed shall be Trade Select™ Wall Wrap Medium Duty single-sided reflective laminate, emittance bright side 0.03. Product is manufactured by Ametalin and shall be installed in accordance with AS/NZS 4200.2: 1994 Pliable Building Membranes and Underlays, Part 2: Installation Requirements. Trade Select™ Wall Wrap Medium Duty should be installed in accordance with AS/NZS 4200.2: 1994 Pliable Building Membranes and Underlays, Part 2: Installation Requirements. Trade Select™ Wall Wrap Medium Duty is not designed to withstand prolonged direct exposure to the elements. Accordingly, the outer construction envelope should be installed without delay. Aluminium foil should not come into contact with wet concrete or mortar, as the aluminium is susceptible to alkali corrosion. 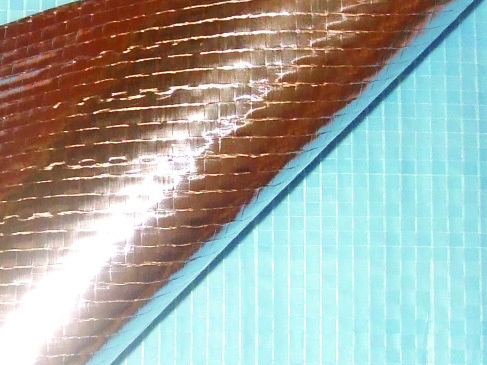 If installed within 500 metres of the sea, or in a non-residential building where foil surfaces may be exposed to a corrosive atmosphere (including agricultural sheds), foil surfaces should face an enclosed, un-vented air space. To ensure optimum thermal insulation performance, as well as satisfactory durability, a 25 mm air space adjacent to the foil side of the product is recommended. Trade Select™ Wall Wrap Medium Duty should be installed horizontally as a continuous membrane by fixing to all framing members with the blue side facing out. Trade Select™ Wall Wrap Medium Duty should extend from the top plate to the bottom plate on concrete slabs or bearers in timber construction. Fixings are to be no more than 450 mm apart and should be galvanised clouts or staples for fastening to timber construction and use tech screws for fastening to steel constructions. In high wind areas, it is recommended to install using at punched multi-point fasteners or cap screws. Horizontal, vertical and end overlaps must be 150 mm if not taped or 50 mm taped with Ametalin Insulation/Ducting Tape, with all top layers overlapping the outside of lower layers to prevent water ingress. Stagger any vertical overlaps. Any damage made to Trade Select™ Wall Wrap Medium Duty during installation including holes and tears must be repaired. Where Trade Select™ Wall Wrap Medium Duty is intended to act as a vapour barrier, tape and seal all overlapped joins, penetrations and discontinuities with Ametalin Insulation/Ducting Tape to prevent air movement. When Trade Select™ Wall Wrap Medium Duty is installed as a sarking membrane, all penetrations shall be sealed or turned up to facilitate drainage around penetration. Ensure window and door openings are cut neatly and carefully and are properly fitted at ashing points. Trade Select™ Wall Wrap Medium Duty shall be cut back from any hot flue to avoid being a fire hazard. This can be achieved by a clear space of at least 50 mm, or as recommended by the manufacturer of the flue and approved by the local authority.